Praying within the will of God is a point of interest for most followers of Christ. How do you pray within the will of God? How do you know the will of God? These are common questions which oftentimes receive a variety of answers. One of the most direct passages which speak to these questions is quoted above. However, this passage offers an encouragement about prayers within Gods will. It does not directly tell us how to pray in Gods will, nor how to discover His will. However, it provides for us a reassurance that God is more awesome and supportive than we may already believe. We are going to highlight pieces of this verse in order to bring a little more understanding into the idea of praying within Gods will. Our weakness is our ignorance. It is displayed by the fact that we have to ask questions in which we really do not know the answers to. In this passage, our weakness is proven in that we do not always know what to pray for. However, God has provided strength to aid our weakness. The main subject in this passage is not ourselves; it is the Spirit of God. 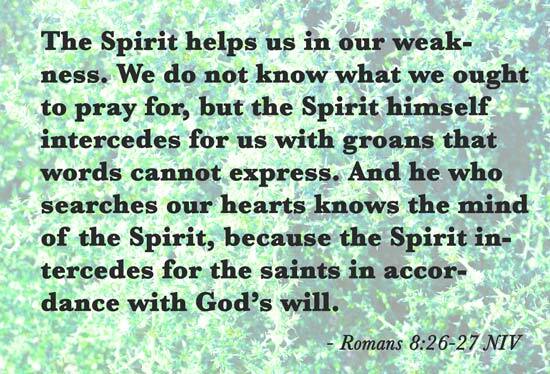 It must be noted that the Spirit intercedes for us. Gods Spirit is not teaching us how to pray, but He is praying for us. This prayer from the Spirit often occurs without our knowledge of its happening. Groans in the Old Testament referred to an unarticulated prayer from Gods people in their time of weakness, the desert wanderings. Their groans called out for Gods completion of his promise to bring them into the promised land. Now the Spirit is calling out for the completion of Gods will in our lives. He is interceding for us, praying on our behalf, that Gods will be completed within a certain situation. Furthermore, God, who knows our most intimate needs and desires also knows what the Spirit is praying as it is perfectly in line with Gods will. We have Jesus interceding for us on the right hand of the Father in heaven, and we have the Spirit interceding for us on earth. There is more prayer happening for us than we have the capacity to pray ourselves! In addition, this prayer is directed by Gods will! While this verse is usually given as an encouragement by itself for understanding Gods will, it is the completion of a larger encouragement on the prayer of Gods will! The word and is the connection of these verses, in other translations the word furthermore is used, which shows the idea of building upon the previous verses. In conclusion, we may desire to know what Gods will is, and rightfully so. We should seek to understand Gods will in all situations. However, we are weak. A cognitive understanding of Gods will in all situations is not likely to be realized until we are made perfect with Him in the new age. In the meantime, while waiting for the completion of His promise, we have the Spirit to intercede for us in full agreement with Gods will. Just as the Israelites longed for completion of Gods promise to enter the promised land with groanings, so too does the Spirit long with groanings for completion of Gods promise to see His completed work within us. So while we may search for understanding of Gods will, we must be sure to rest knowing that God is on our side. He is helping us, His Spirit is praying for us, and everything is coming together as God is directing. Although we may not understand, we can know God is working for the positive in our lives. How beautiful it is, that Gods will is being prayed for us, all while we have no clue of its happening. How awesome is our God, that He is providing for us beyond our scope of understanding! Thank you God, for helping me in my weaknesses. I will continue to search for your will in all situations. But please, help me rest in the assurance that you are on my side. Let me find peace knowing that youre working on my behalf. Let me understand your will, but furthermore, let me understand that your Spirit is praying for the completion of your will in my life on a daily basis. Return soon Lord Jesus and finish your work in us, that we may be perfect and completely one together with you.